Discover the sparkling musical treasures of old-time Naples, as the new Australian baroque orchestra Van Diemen’s Band presents its debut album – connecting the pristine wilderness and Antarctic gateway of present-day Tasmania with one of eighteenth-century Europe’s greatest sea ports. Recorded in the beautiful acoustics of Government House in Hobart, this album unveils a rich and much-neglected artistic culture, where music flourished in churches, courts and academies. At the centre of the album stands Nicola Fiorenza, a composer and violinist with a famously eccentric and hot-blooded temperament, who played for many years in the Orchestra of the Neapolitan Royal Chapel. 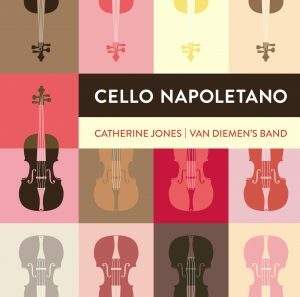 His Cello Concertos, four of which are presented here, are by turns urgently virtuosic, stunningly rhapsodic, and almost completely unrepresented in recordings – until now. Musicians from leading early-music orchestras throughout the world gathered in Hobart for these sessions, reflecting the sea-faring cosmopolitanism of Hobart and Naples. Julia Fredersdorff, returned to Australia after many years performing and studying in Europe, is the orchestra’s Artistic Director. The Lake Como-based soloist, Catherine Jones, is one of the most in-demand baroque cellists on the international stage. And the orchestra itself is hand-picked from the most promising players of the new generation as well as the cream of the established crop. Alongside music by Fiorenza, the album features works by other Neapolitan luminaries: a Sinfonia by Alessandro Scarlatti (another by his son, Domenico, is available as a digital bonus), and a Concerto Grosso by Francesco Geminiani, all of which show the irresistible influence of the art form that was popular in Naples at the time – opera.